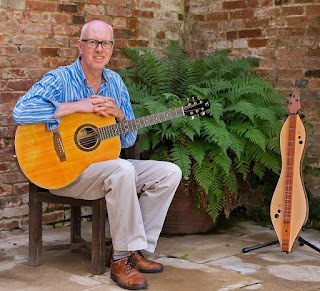 Over three decades Dan Evans has built a niche career as a world-class exponent on both the mountain dulcimer and acoustic guitar. He accompanies his fine baritone voice with beautiful and original dulcimer and guitar music. With five CD albums released to critical international acclaim and eighteen international tours undertaken to date, Dan has won the hearts of audiences on both sides of the Atlantic. Last year saw Dan perform at Nashville’s prestigious Turner Hall and his latest album Au Vieux Moulin has all but sold out in just three years. For this, his thirteenth visit to Ealing Guitar Society, Dan will bring new instruments, new tech and new music. The Garden Waltz ~ an original guitar duet played on a single guitar using sampling.